How to accomplish more with the same or even fewer resources. In today's work environment, employees are being asked to do more and more with less support than ever before. High productivity is important and can be the main difference between a good and a great employee. At the heart of all highly productive workers is the efficiency at which they do their job. This applies in marketing as well as every position in every department in your company. Being more efficient in your daily tasks creates the leverage to help you accomplish more. Here are a few key ways to help you achieve more with less. Using an outside service provider can be a huge help in making you more productive. Departments that used to run with 3 employees may be running with 2 these days due to cut backs. Outsourcing allows you to have a "virtual employee" capable of accomplishing a specific set of tasks to take the work off of your plate. Often companies outsource projects that can be accomplished easier by a service provider who specializes in what they're trying to get done. What's more, a service provider can bring years of experience and knowledge to help you be more effective in reaching your goals. For example, marketing departments will often outsource graphic design work to outside designers or the fulfillment of a direct mail piece with a printer who specializes in mail services. Another great way to be more efficient is to upgraded the software you use on a daily basis. The latest email program, the current version of Microsoft Word or the upgraded Adobe InDesign can allow you to utilize the newest features of the software and make your job easier. Is there some software you should be looking into updating today? Just like software, hardware can be upgraded to make your job more streamlined. New equipment can often times help you accomplish more in a shorter period of time. Maybe it's a new scanner to process digital images at a faster pace. Or what about the old paper shredder that takes 30 minutes to shred a stack of paper? Curry has recently upgraded several pieces of equipment to help improve our efficiency. 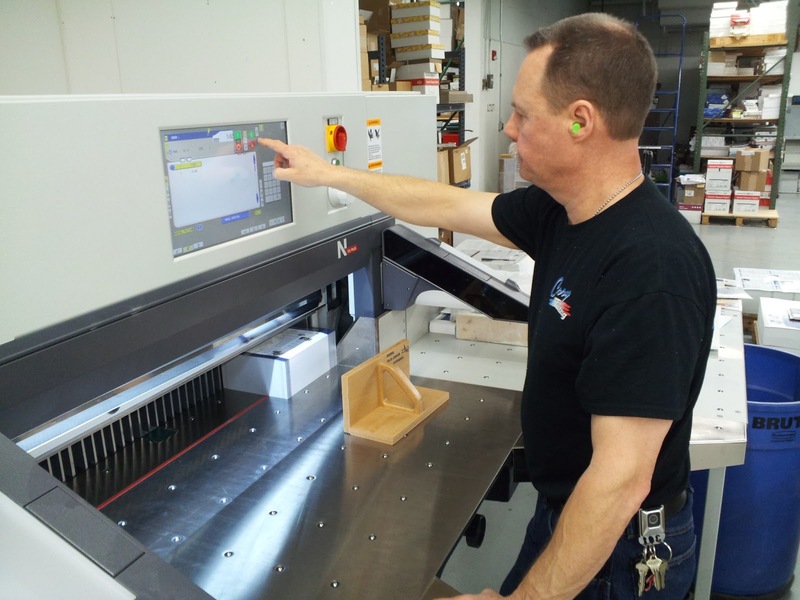 A new paper cutter, collator and digital output devices help streamline our processes so we can accomplish more with less. This helps us save time while offering a better end product to our clients. Whether it's outsourcing projects, updating software or investing in better hardware, we recommend evaluating your business processes at least once per quarter to determine how you can be more effective. You'll be amazed at how much changing your approach will help you increase productivity.